What was initially seen as an continuation of a previous day’s pullback, the session on Tuesday turned bearish as the NIFTY came off nearly 60-odd points from the high point of the day. The last hour and half of the session saw this paring of gains and the benchmark NIFTY50 ended the day with nominal loss of 29.30 points or 0.28%. We enter the penultimate day of expiry of the current derivative series and the session on Wednesday is likely to remain dominated with rollover centric activities. We continue to expect the session to remain in a defined range with the upsides continuing to face resistance at higher levels. Wednesday’s trade is likely to see the levels of 10395 and 10440 playing out as immediate resistance area. The supports exist at 10320 and 10250 zones. 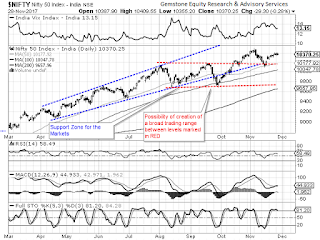 The Relative Strength Index – RSI on the Daily Chart is 58.4885 and it remains neutral showing no divergences against the price. The Daily MACD stays bullish while trading above its signal line. The frequent occurrences of Spinning Tops on Candles evidently portray indecisiveness of Market participants at any given levels. The pattern analysis show that post forming of 10490 levels as its immediate highs, any likely downsides from the current levels at Close levels will see formation of a lower top. It is further evident from the pattern analysis that unless the levels of 10490 are breached on the upside, no sustainable up move may be seen. For a clear breakout to occur, the levels of 10490 remain critical. It would not be sufficient for the Markets to give marginal highs at higher levels. It will require a clean break out to occur. Also, going ahead from here, the Market breadth which is little weak and fractured still remains a niggling worry for the Markets. Overall, though no signs of any immediate major downsides, it is very much likely that the upsides will still continue to face resistance and selling pressures at higher levels. It becomes, therefore, important to continue to guard profits at higher levels. 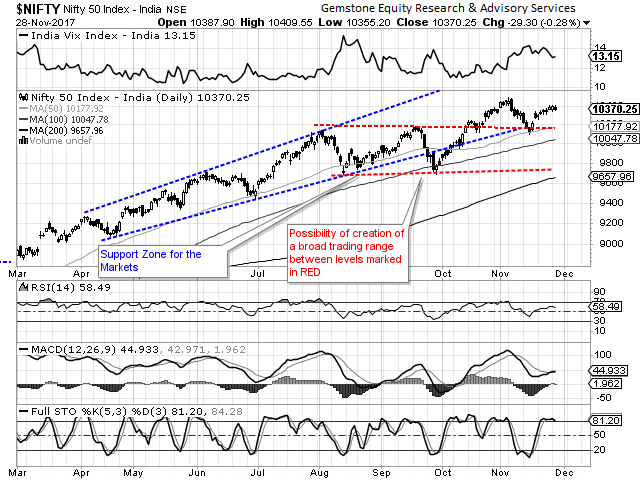 Cautious and stock specific approach is advised for the day.